Fibers with a smaller number of guided modes, e.g. with V numbers between 3 and 10, are sometimes called few-mode fibers. Multimode fibers are required, if light with poor spatial coherence needs to be transported. For example, this is the case for the output of typical high-power laser diodes, such as diode bars. Whereas only a tiny portion of their output power could be launched into a single-mode fiber, very efficient launching is possible for a multimode fiber with sufficiently large core and/or high NA. Another example is the use of light-emitting diodes (LEDs) instead of laser diodes as cheap signal sources in fiber-optic links. Other applications exist imaging, for example; the transmission of image information requires devices with many spatial modes. A basic specification of a multimode fiber contains the core diameter and the outer diameter of a multimode fiber. Common telecom fibers (fibers for optical fiber communications over moderate distances) are 50/125 μm and 62.5/125 μm fibers, having a core diameter of 50 μm or 62.5 μm, respectively, and a cladding diameter of 125 μm. Such fibers support hundreds of guided modes. Large-core fibers with even substantially larger core diameters of hundreds of micrometers are also available. Our software RP Fiber Calculator can calculate the launch efficiency of a misaligned Gaussian laser beam. It tells you how much power gets into each mode. For more comprehensive calculations, e.g. for arbitrary input beam profiles, our RP Fiber Power software is the ideal tool. This is actually the approximate beam quality factor from the fiber if the optical power is well spread over all modes. (The estimate is accurate only if the fiber has many guided modes.) Of course, efficient launching does not only require a low enough M2 factor, but also a suitable shape of the intensity profile in real space and Fourier space. 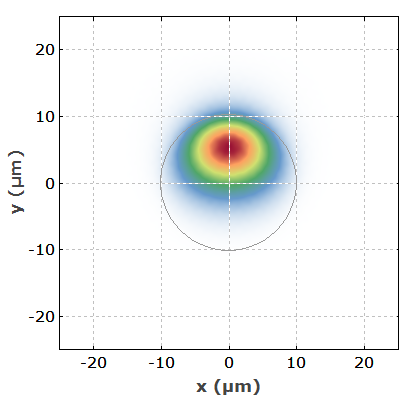 As an example, consider a fiber with 25 μm core radius and a numerical aperture of 0.2. 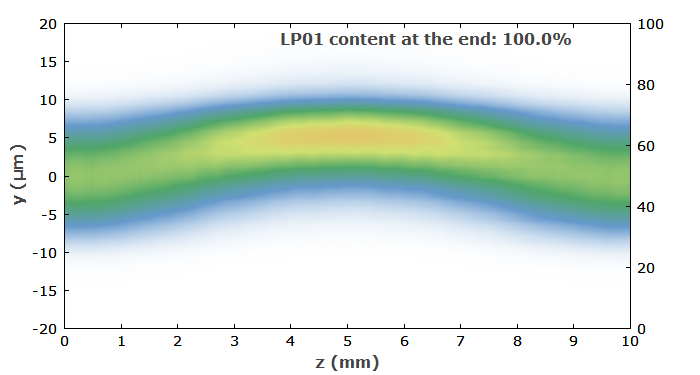 Figure 2 shows the intensity profile of a monochromatic input beam at 1000 nm, which has been numerically constructed such that it just fills the fiber core and also has an angular distribution which reaches out up to the limit set by the numerical aperture of the fiber. 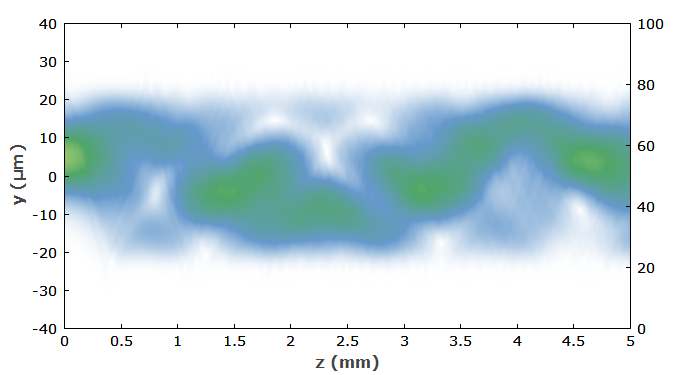 The beam profile was essentially made by starting with a super-Gaussian intensity profile with entirely random phase values (leading to a huge divergence), then filtering with another super-Gaussian function in the Fourier domain, and once again applying the super-Gaussian filter in the spatial domain. 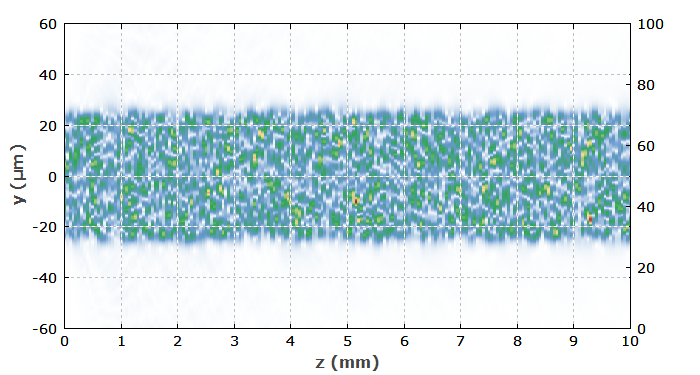 Figure 2: Intensity profile of a multimode beam which has about the maximum possible M2 value for efficient launching into the fiber. The constructed beam turns out to have an M2 value of 12, which is not far below the limit of 15.7 as calculated from the formula mentioned above. Figure 3 shows how it propagates in the fiber. The beam profile undergoes strong changes in the fiber, but nearly all of the light stays guided. Figure 3: Evolution of the intensity profile in the fiber. Only little light is lost to the cladding in the first few millimeters. Similar simulations exhibit substantial launch losses if the initial beam size or the angular range is further expanded. Also, efficient launching requires a somewhat lower M2 value (below 10) if the beam profile is roughly Gaussian rather than super-Gaussian. If one would launch light into specific high-order modes, that light could have a roughly 2 times larger M2 value than according to the formula above. Our software RP Fiber Calculator can calculate the light propagation in fibers based on the calculated core modes. The more sophisticated product RP Fiber Power also offers full numerical beam propagation. The output beam profile from a multimode fiber depends on the launch conditions. In addition, it depends sensitively on the conditions (bending, temperature, etc.) of the whole fiber. This is because such effects influence the β values of all the modes, and therefore the interference conditions. Over a long length of fiber, even tiny changes of β values can have pronounced effects. Multimode fibers are sometimes used for beam homogenization, i.e., for obtaining a smoother intensity profile. That works well, however, only for polychromatic light, where the profiles for different frequency components average out. Under which circumstances can be we have single-mode propagation in a multimode fiber? If one launches light entirely into the fundamental mode of a multimode fiber, the beam profile should in principle stay unchanged during propagation. One would then obtain an output with high beam quality, similar to that of a single-mode fiber. However, various kinds of disturbances may lead to mode coupling: some light may be coupled into higher-order modes, so that the beam quality can be spoiled. Figure 4: The beam profile in the middle of a bent fiber is substantially shifted away from the center of the core. Figure 5: Evolution of beam profile in a fiber which is bent in the middle part only. (The spatial coordinates do not reflect the bending, which is simulated as a linear addition to the index profile; one sees only the shift of the mode profile as a consequence of the bending.) The beam profile nicely comes back to the original position at the fiber end. One may wonder why essentially no light is coupled into higher-order modes despite the strong bending effect. For this we need to consider the difference in phase constants for the LP01 and LP11 modes, for example, which is as high as 4.5 rad/mm. 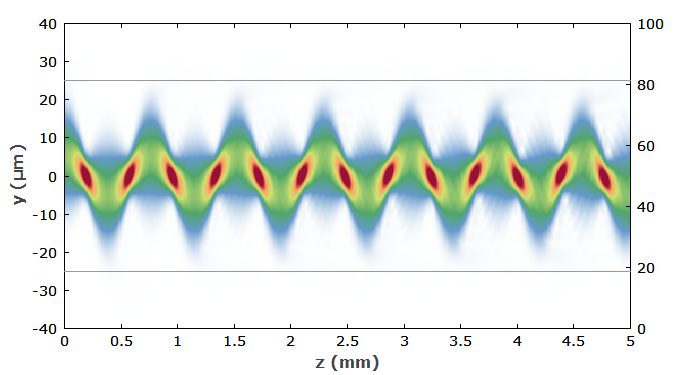 That phase mismatch effectively suppresses the coupling: the amplitude contributions coupled from the fundamental mode to some higher-order mode in different parts of the fiber will overall largely cancel each other. 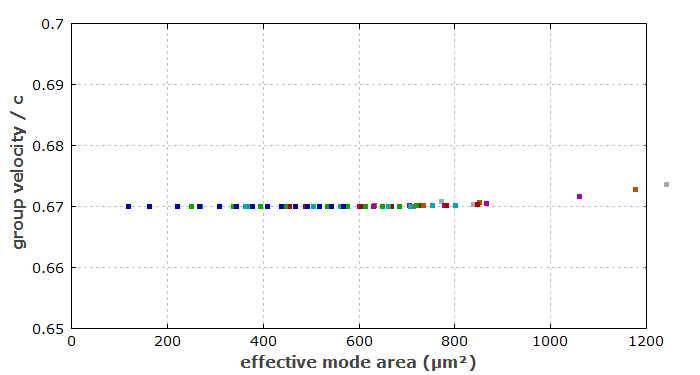 For fibers with large mode areas, the β values of different modes come much closer. Therefore, the beat length of two modes is much longer, and even relatively slowly changing disturbances can effectively couple modes. It is therefore more difficult in large mode area few-mode fibers to preserve single-mode propagation. For telecom applications, it is sometimes desirable to minimize the intermodal dispersion, i.e., the width of the range of group velocities. This leads to reduced temporal spreading and distortion of telecom signals and thus allows for higher data rates. Step-index fibers are not good in this respect. It has been found that graded-index fibers with a close to parabolic index profile are much better suited for such applications. Figure 6 shows such an index profile. 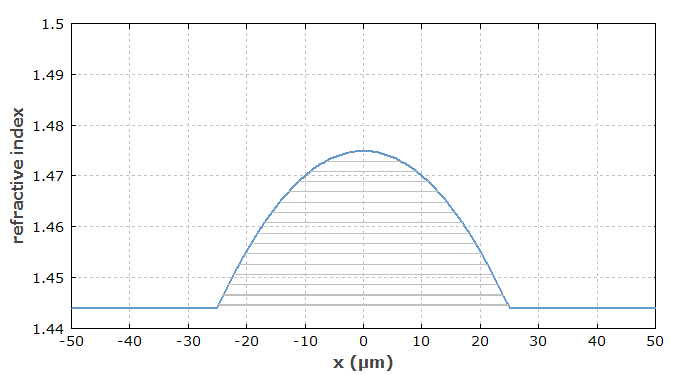 Figure 6: Refractive index profile of a graded-index fiber, which is parabolic in the core region. The effective refractive indices of the guided modes (shown as gray lines) are equally spaced. In an intuitive picture, one may consider that rays oscillating around the fiber axis have a longer path length than a ray going straight through, but that this can be compensated by a lower refractive index in the outer regions which the oscillating rays see. Such vagues ideas, however, are often quite misleading. For example, they may create the expectation that higher-order fiber modes, having increased transverse wave vector components, experience larger phase delays in fibers, while the opposite is true. Therefore, we recommend to use such ideas with care and skepticism. 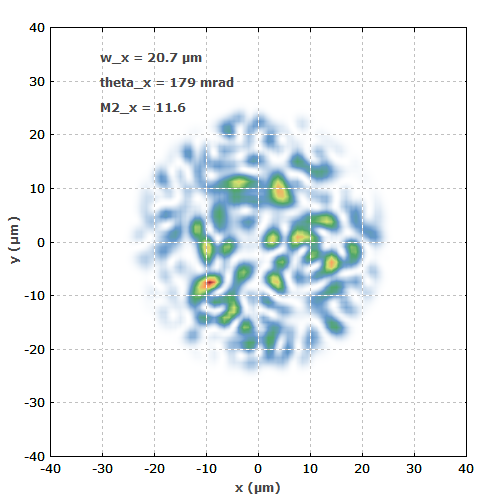 Figure 7 shows a simulation, where a Gaussian input beam has been somewhat displaced against the center of the fiber core. In the fiber, the intensity profile oscillates without fully reaching the edges of the core region. Figure 7: Beam propagation in a graded-index fiber, where a Gaussian input beam has been slightly offset against the center of the fiber core. The horizontal gray lines indicate the edges of the core. For comparison, Figure 8 shows the same for a step-index design with the same core radius and maximum refractive index. The result looks quite different. Figure 8: Same as Figure 7, but for a step-index profile. Figure 9 shows one point for each mode of the graded-index fiber, where the coordinates represent the mode area and the group velocity. One can see that the group velocities are nearly the same for all modes, whereas the effective mode areas span a large range. Figure 9: Group velocity versus mode area for a graded-index fiber with parabolic index profile. (For simplicity, the material dispersion was ignored for the index profile.) Different colors indicate different m values. The group velocities are nearly the same for all modes. Go to Part 5: Fiber Ends or back to the start page.